Albuquerque Police / UNM Lobo Football Youth Day! Come join the men and women of the Albuquerque Police Department and the UNM Lobo Football Team for a day of fun! Participants will be given a tour of the Tow Diehm Football Complex, have a chance to watch the Lobo Football Players practice, get to meet many of the specialized units from the Albuquerque Police Department and have an opportunity to run practice drills at the Dreamstyle Stadium! Lunch will be provided courtesy of Chick-fil-A. 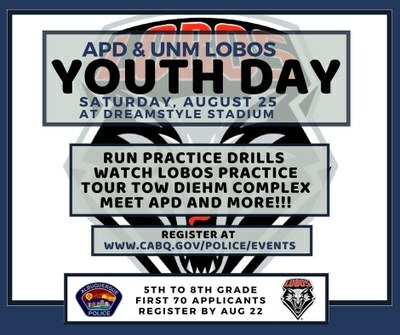 The Albuquerque Police Department (APD) and the University of New Mexico Lobos Football Team will be hosting a youth day, named APD/Lobos Football Youth Day. The purpose of this day is to foster a positive relationship with law enforcement, engage with positive role models, promote an interest in sports activities and understand the importance of community. A total of seventy children from 5th grade to 8th grade from the Albuquerque area will be selected to attend this event. Selections will be based on the submitted applications and the parent(s)/guardian(s) ability to provide transportation for their child(ren)/ward(s) to and from the facility. Applicants will be selected on a first come, first serve basis. Submit completed paper forms between 8 a.m. and 4 p.m, Monday through Friday to the APD Academy, located at 5412 St NW. Email completed forms to [email protected]. A separate registration packet must be completed for each child who wishes to participate. In order for your child(ren) to be considered, ALL forms must be completed and received no later than Aug. 22, 2018. Those selected to attend will receive notification via phone or e-mail by August 24, 2018.